The introduction of Mountain Lion brought OS X undeniably closer to merging with iOS. The majority of the update focuses on features originally designed for our iOS devices, and one of the most notable features is a Notification Center almost identical to the iOS 5 version. If you happen to miss a notification or want to view a history, the Notification Center is available to view and remove past alerts like in iOS. 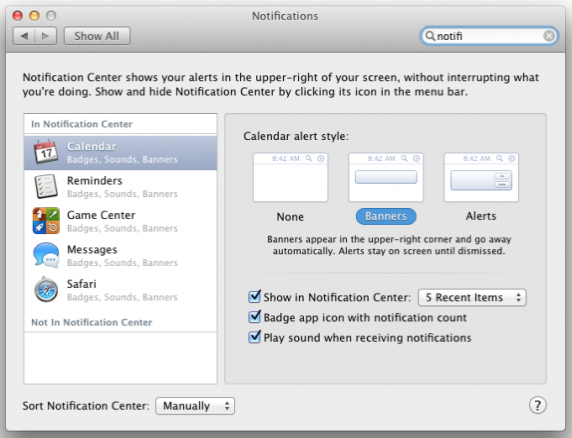 In Mountain Lion, the Notification Center reveals from a narrow pane on the right side of your screen through a small icon in the upper right corner of the menu bar (next to Spotlight) or by swiping to the left. Apple noted the Notification Center is even accessible by swiping left when using full screen apps. As for how you control Notifications, you will find a new System Preferences pane (pictured above) that lets you set the frequency and type of alerts for specific apps. Notifications will work with Mail, Calendar, Messages, Safari, Reminders, and system updates, but we can expect many third-party devs— including support for the feature—in future updates. Along with Apple’s integration of Twitter into Mountain Lion, Twitter is already integrated with the new notifications. We also expect to see much more integration with notifications for apps on iOS and for notifications we receive in the new Mountain Lion Notification Center. Another notable change Apple introduced with Mountain Lion is removing Software Update that use to sit under the Apple icon menu in the menu bar. Updates you used to find in “Software Update” will now appear in the “Updates” tab within the Mac App Store app (pictured below).